Muugu Fork - Halal Cafe, Rainbow Cheese Dippers! Hello Cheese Lovers! 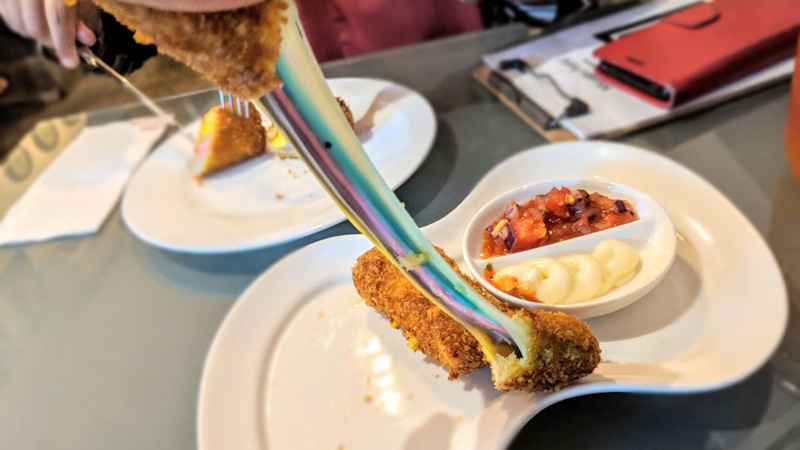 Have you tried the Rainbow Cheese Dippers at Muugu Fork? 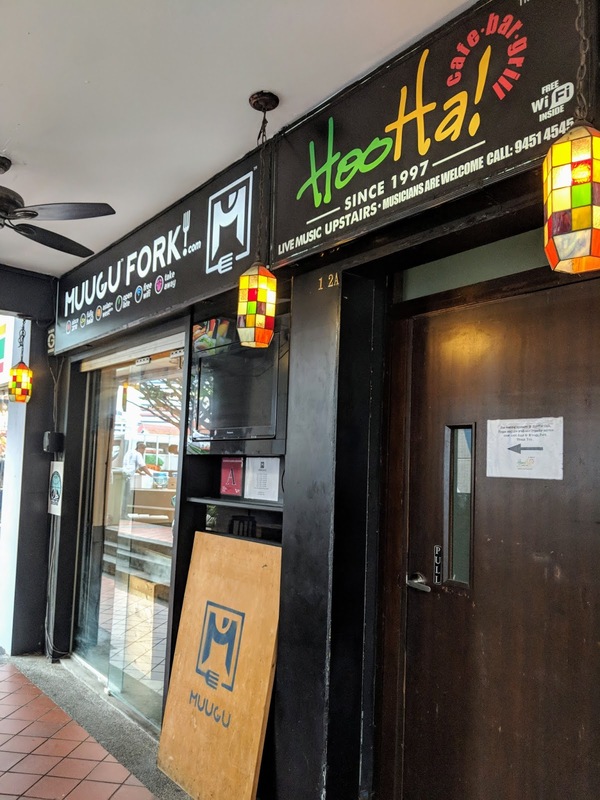 Muugu Fork is a Halal certified cafe at Arab Street. 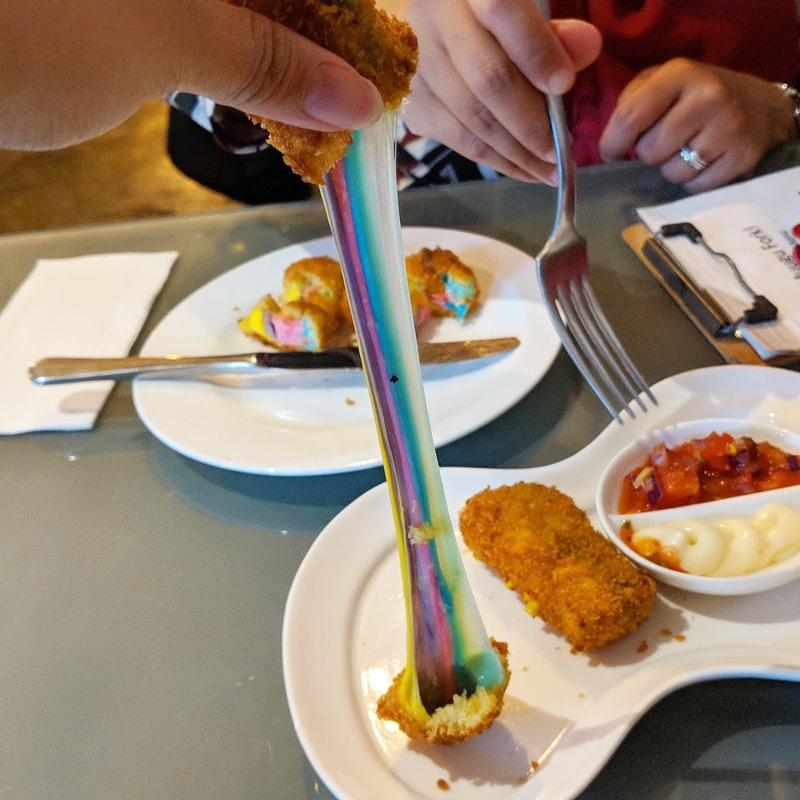 It has been serving cafe food since 2010 and recently, it launched its very instagram worthy Rainbow Cheese Dippers! Why is Muugu Fork perfect for a good time with friends? A good location is very important when we are organising a catching up session with friends especially those whom we have not met for a while. Sometimes, we are just too shy to voice our grunts whenever the location is not easily accessible or too far off. Muugu Fork is centrally located at Arab Street and is a 5 minutes walk from Bugis MRT station. Perfect! 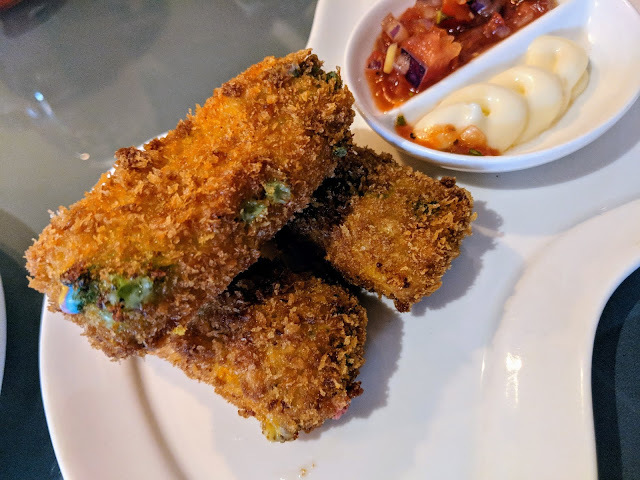 I am a cheese lover, especially fried cheese. A good Fried Cheese has to be firm and yet chewy,coated with a cripsy batter. Look at the picture below. I could do a long cheese pull with one hand and take the shot with the other. Rainbows always bring cheer and excitement. Pretty! Muugu Fork put in effort in the dips that came with the Rainbow Cheese Dippers. The mayonnaise had an amazing aroma from garlic? The salsa dip was also very refreshing and delicious! Thumbs up! 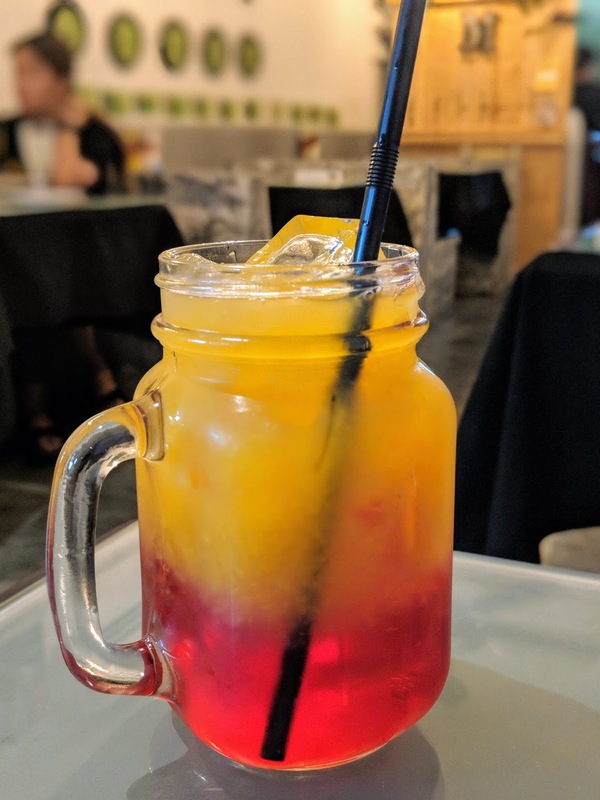 The menu has a variety of drinks, ranging from pots of calming teas and coffees to even Mocktails. We ordered a pot of tea and the cafe was nice in providing 2 cups. I had experience in other cafes whereby they have this irritating rule of One Teapot One Cup $%#*. You can access Muggu Fork menu here. I was very impressed that the cafe served small bites, pastas, pizzas, local delights and desserts! There is something for everyone and this is important when organising a gathering for friends. We wanted to order Crab Cakes but it was not available. The food items were priced reasonably. One can easily get a good meal for below S$20. Around 7ish, the cafe was packed. 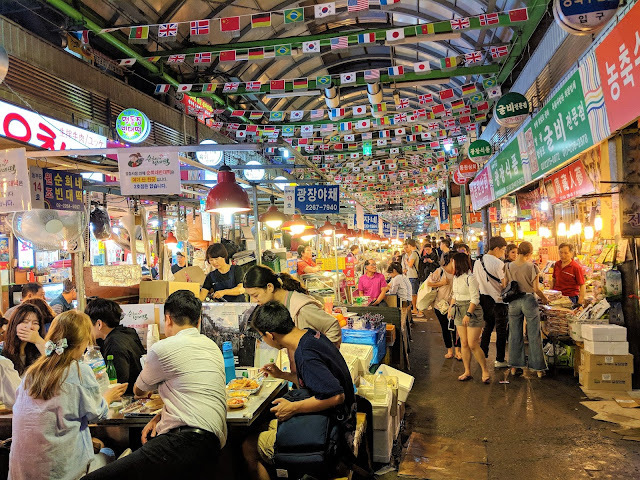 Although it was crowded, it was not overly noisy. We were seated at a nice corner, indulging ourselves in girly talk. The cafe was dimly lit, providing a cosy atmosphere. I felt relaxed. After our Rainbow Cheese Dippers, we did not order anything else because we had our dinner appointments elsewhere. Never once did I felt pressured to leave or to order more. We ordered a pot of hot green tea and continued to chillax for another hour or so. 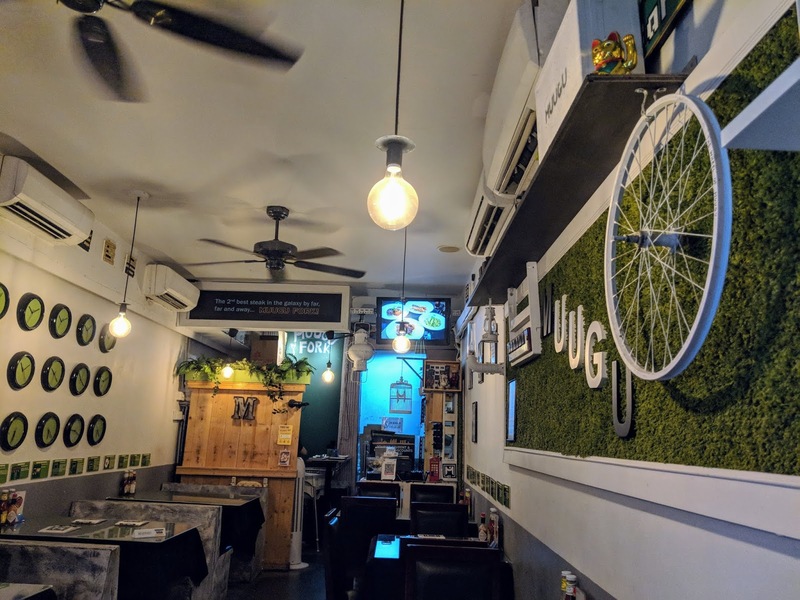 I will definitely look forward to trying more food at Muugu Fork! I was searching for Muugu Fork address to paste onto my blog and was kindly informed by Google that I visited this place one week ago! Creepy! Google knows our every whereabouts. "Your past visits: You visited 1 week ago ·"
If you have enjoyed reading my post, feel free to share it with your friends! Enjoy!